The serval is a wild cat native to Africa. It is rare in North Africa and the Sahel, but widespread in sub-Saharan countries except rainforest regions. On the IUCN Red List it is listed as Least Concern. Active in the day as well as at night, servals tend to be solitary with minimal social interaction. Both sexes establish highly overlapping home ranges of 10 to 32 km2 (4–12 sq mi), and mark them with feces and saliva. Servals are carnivores – they prey on rodents (particularly vlei rats), small birds, frogs, insects, and reptiles. 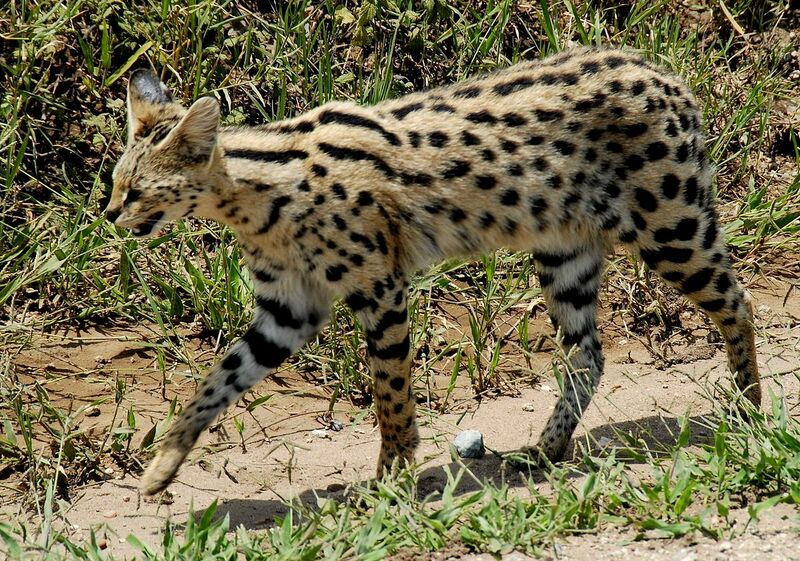 The serval uses its sense of hearing to locate the prey; to kill small prey, it leaps over 2 m (6 ft 7 in) above the ground to land on the prey on its forefeet, and finally kills it with a bite on the neck or the head. Mating takes place at different times of the year in different parts of their range, but typically once or twice a year in an area. After a gestational period of two to three months, a litter of one to four is born. Weaning occurs at one month, and kittens begin hunting on their own at six months. The juveniles leave their mother at 12 months. 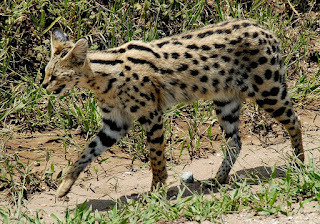 The serval is a slender, medium-sized cat; it stands 54 to 62 cm (21–24 in) at the shoulder and weighs 8 to 18 kg (18–40 lb), but females tend to be lighter. The head-and-body length is typically between 67 and 100 cm (26–39 in). Males tend to be sturdier than females. Prominent characteristics include the small head, large ears, spotted and striped coat, long legs and a black-tipped tail that is around 30 cm (12 in) long. The serval has the longest legs of any cat relative to its body size, largely due to the greatly elongated metatarsal bones in the feet. The toes are elongated as well, and unusually mobile. Both sexes become sexually mature when they are one to two years old. Oestrus in females lasts one to four days; it typically occurs once or twice a year, though it can occur three or four times a year if the mother loses her litters. Observations of captive servals suggest that when a female enters oestrus, the rate of urine-marking increases in her as well as the males in her vicinity. Zoologist Jonathan Kingdon described the behaviour of a female serval in oestrus in his 1997 book East African Mammals. He noted that she would roam restlessly, spray urine frequently holding her vibrating tail in a vertical manner, rub her head near the place she has marked, salivate continuously, give out sharp and short "miaow"s that can be heard for quite a distance, and rub her mouth and cheeks against the face of an approaching male. The time when mating takes place varies geographically; births peak in winter in Botswana, and toward the end of the dry season in the Ngorongoro Crater. A trend generally observed across the range is that births precede the breeding season of murid rodents. Gestation lasts for two to three months, following which a litter of one to four kittens is born. Births take place in secluded areas, for example in dense vegetation or burrows abandoned by aardvarks and porcupines. Blind at birth, newborn weigh nearly 250 grams (9 oz) and have soft, woolly hair (greyer than in adults) and unclear markings. The eyes open after nine to thirteen days. Weaning begins after a month of birth; the mother brings small kills to her kittens and calls out to them as she approaches the "den". A mother with young kittens rests for a notably lesser time and has to spend almost twice the time and energy for hunting than do other servals. If disturbed, the mother will shift her kittens one by one to a more secure place. Kittens eventually start accompanying their mother to hunts. At around six months, they acquire their permanent canines and begin to hunt themselves; they leave their mother at about 12 months of age. They may reach sexual maturity from 12 to 25 months of age. Life expectancy is about 10 years in the wild, and up to 20 years in captivity.